It’s summertime. And, probably, you have planned for an exciting vacation by the ocean. Or, maybe you have decided to have a weekend getaway to a lake house. But, have you settled on the best floating island raft to make that moment memorable? This article aims to equip you with all the information you will need for you to make a perfect choice of inflatable party island to suit your specific needs. 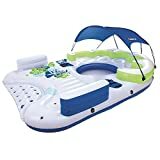 On top of that, you will find an ‘inflatable island review’ section featuring the top inflatable island float in 2019. But, let’s start with the basics. Why should you buy an inflatable floating island? What should you look at before buying a floating Island? Where will you be using your raft? It is a great place to lounge, party, or hang out with friends and family. If you are having a swim by the ocean, you don’t have to keep on going back and forth the shore for beverages or to take a break. There is pride in owning one. Or doesn’t it feel nice being the hero among your friends? It offers a great platform for those looking to naturally sun tan their skin. The breeze from the ocean and the gentle rocking movements from the water are ideal for a perfect meditation session. If you intend to invest in an inflatable island raft for your swimming pool, then you do not have to worry too much about the quality. This is because the island will not be exposed to bruises since there are barely any obstacles in a pool. Also, the size of the island lounge you buy will be largely determined by the size of your pool. On the other hand, if you intend to use it for beach parties or lake and rivers getaways, then go for a large inflatable raft that is durable and well resistant to possible bruises by the sand and rocks. How much money are you willing to spend on your ideal blow-up island? The answer to this question will determine what kind of floating island you purchase. A good idea is to do extensive research, compare prices from different sellers, and to look at as many reviews as you can. This will help you identify a raft that gives you maximum value for your money. Are you looking for an island to take to the river? Then a towable floating island will be the best for you. Similarly, a person looking for a party island float should go one that is spacious and has upright seats. And if a person is targeting relaxation, then they should opt for a floating blow-up island that prioritizes on comfort. For other buyers who intend to purchase a raft for their kids, then it is better to ensure it can be easily accessed, is sturdy, and is strong—to withstand mishandling. The intended purpose of your island is an important fact in the choice of your ideal floating raft. These inflatable floating islands normally come in different capacities. Some are built to accommodate just a single person while others can comfortably host more than ten adults. So, if you have a big family or a looking to host a group of more than 8 adults, then shop for the largest multi-person water lounge available. And, if the raft is for your personal use, then a small-sized island will be perfect. What is the size of the island once it is fully inflated? This is an important factor that will help you determine whether the inflatable island for sale will fit in your pool or is only ideal as large party floats for lake relaxation. For those who intend to float away in the ocean while being shaded away from the scorching sun, then an inflatable island with shade will come in handy. 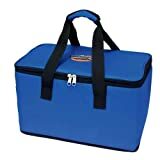 Others, who would like to carry their drinks on board, should choose an inflatable multi-person float that has built-in coolers and cup holders. This will offer the much-desired hustle free relaxation or partying experience. By having a closer look at the material used in the production of your island floats, then you are able to access the durability and comfort of a floating island. If your money allows, choose rafts that are constructed using durable materials. These will offer you service for longer periods. A quick fill pump will be a time savior for easier inflation of your floating island. This is especially crucial if you are looking to purchase large lake floats. A good choice of a pump is one that is easily portable since it is you will need to inflate your island after reaching your destination. Although a hand pump would still work, it will be very tiresome and time-consuming. Therefore, consider a pump that you can easily plug into your vehicle outlet. You may need to transport food and drinks to the raft once it is in the water. Also, other things like music players may be too heavy for one person to carry. Therefore, having a small boat will come in handy. Unless you do not mind being floated away by the wind into the deep oceans, investing in a strong anchor is very crucial. On top of having an anchor, it is advisable that you invest in getting some good paddles. They will be of great help should your inflatable island drift away into the waters. If you are looking to have a lazy day floating on the beach or a party by the lake with your friends or family, then this is for you. The Tropical Tahiti is a huge inflatable island that has two amazing sun tanning desks ideal for sunbathing. Additionally, it has 8 cup holders, and 2 built-in coolers to store your drinks. Another addition is a built-in platform for easy access to the party raft. 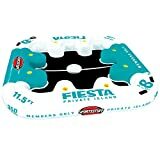 The SPORTSSTUFF fiesta is an 11.5″ x 11.5″ party island inflatable raft that can comfortably hold up to 8 people. It comes with a 16 Quart detachable inflatable cooler and eight built-in cup holders. On top of that, it has mesh seats with contoured backrest that guarantee maximum comfort. As if that’s not enough, this Fiesta Island has molded handles which makes its transport to and fro the water much easier. Are you looking for an ideal inflatable island for lake parties or hangout? Then, this could be what you are looking for. The 129″ x 121″ x 36″ raft comes in a pleasant blue, a white and yellow color combination which will brighten the mood of every party. It can accommodate up to 6 adults, has 6 built-in cup holders and two built-in coolers for your drinks. For ease of in and out of water access, this aqua lounge is fitted with 3 platforms. Another feature to note is that it has one anchor bag with a rope to easily secure it to a dock or to your poolside. The highlight of this island is that it has two built-in waterproof speakers with a separate waterproof battery and an MP3 compartment to give you the ultimate party experience. As its name suggests, the Intex Pacific raft offers you an ultimate paradise relaxation experience. This 4-person floatable island is carefully designed to include 4 strong grab handles and a rope ladder with sturdy steps for easy access from the water. For the best relaxation experience, the party raft has 4 drink holders and its seats are fitted with comfortable backrests. On top of that, the mesh netting at the middle helps to keep any organism away as you enjoy a cool dip in the waters. 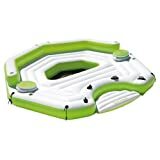 This is a beautiful and large inflatable island from Sun Pleasure that is perfect for any beach or lake party. Shaped likely a fairy unicorn, this colorful 10-inch tall raft is a sight to behold. It can comfortably accommodate up to 6 people and has ample floor space that enables people to move around freely. 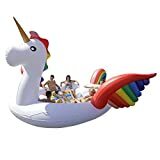 Additionally, this party bird has large and comfortable seats that will give you and your friends a perfect relaxation time either in the ocean, river or pool. A built-in cooler and cup-holders will ensure that your refreshments are cool even in the hot summer sun. Also, it comes with a built-in platform and durable handles to ensure anyone can get in and out even with no assistance. The CoolerZ Tropical Breeze is a 6-person water float for adults. This floating island is an excellent choice for people looking to relax under the hot summer sun. Its seats have extra wide pillow backrests that offer the best relaxation experience. Other additions include a cooler bag and six cup holders. 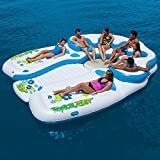 This is an excellent choice of a giant inflatable island for a family with kids or a group of friends looking to hang out and relax while floating on a lake, river, or a large pool. Parents d have no worry knowing that the children are safely playing in the middle mesh area. Or, if you are looking to have a group getaway, the built-in coolers will keep your drinks cool all day. There are 4 handles that act as great support for people on board. And on top of that, the heavy-duty PVC material ensures that your island offers comfort as well as resistance to punctures. This is another party island inflatable raft from CoolerZ. It also comes with a removable sunshade but unlike the CoolerZ Tropical Breeze, it is much bigger as it measures approximately 157″ x 122″ x 27″ and can comfortably host 7 adults. Another notable difference is that it has two cooler bags instead of one. Other additions include a mesh bottom to cool off your legs, 6 cup holders, and grab ropes on both ends. The manufacturer also included a swim-up platform to make it easier for you to get in and out of the island. The sunshade acts like a sail when there are strong winds. There are very many inflatable floating islands available in the market today. However, it is extremely important that you are able to identify the ideal floating island tailored to your specific needs. One that guarantees you lots of fun, relaxation, and a great hangout—whether with friends or family. So, before you settle on which one to buy, remember to look at its features, capacity, and of course, its quality. Hopefully, this article has equipped you with all the information you require in making a more informed choice of the perfect inflatable floating island.